DIY History | Transcribe | Social Justice | I.C. Notebooks 1 | 1971-09-28 Daily Iowan Article: ""City park light show planned by UI artists""
1971-09-28 Daily Iowan Article: ""City park light show planned by UI artists""
HE DAILY IOWAN - Iowa City, Ia. 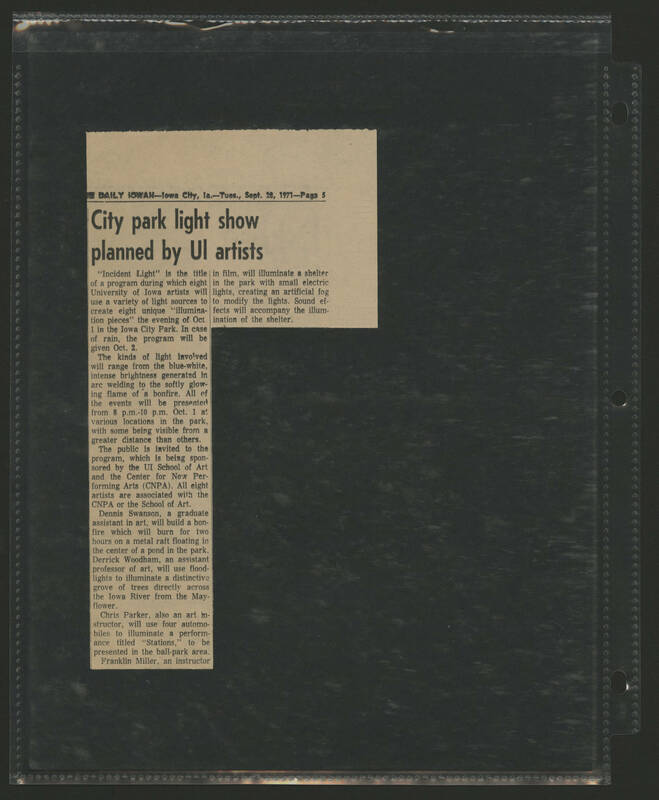 - Tues, Sept. 28, 1971- Page 5 City park light show planned by UI artists. "Incident Light" is the title of a program during which eight University of Iowa artists will use a variety of light sources to create eight unique "illumination pieces" the evening of Oct. 1 in the Iowa City Park. In case of rain the program will be given Oct.; 2. The kinds of light involved will range from the blue white intense brightness generated in arc welding to a softly glowing flame of a bonfire. All of the events will be presented from 8 p.m.- 10 p.m. Oct. 1 at various locations in the park with some being visible from a greater distance than others. The public is invited to the program, which is being sponsored by the UI School of Art and the Center for New Performing Arts (CNPA) All eight artists are association with the CNPA or the School of Art. Dennis Swanson, a graduate assistant in art, will build a bonfire which will burn for two hours on a metal raft floating in the center of a pond in the park. Derrick Woodham, an assistant professor of art, will use flood lights to illuminate a distinctive grove of trees directly across the Iowa River from the Mayflower. Chris Parker, also an art instructor, will use four automobiles to illuminate a performance titled "Stations" to be presented in the ball park area. Franklin Miller, an instructor in film, will illuminate a shelter in the park with small electric lights, creating an artificial fog to modify the lights. Sound effects will accompany the illumination of the shelter.